Which then showed a visual process of creating your own tree stump grill. Use a chain saw to cut most of the way through the stump in wedge shapes. Leave the bottom intact so that your stump stays together. Not sure what they used, I’m going to guess charcoal, but light and place in middle of stump wedges. 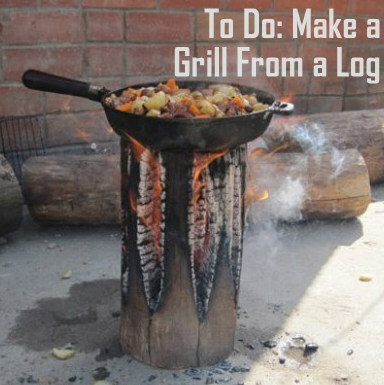 Heat your cast iron pan and start cooking your food of choice using the top of the stump as a mini stove top. When done, be sure to put your stump fire out well so not to catch the yard, woods, field, etc. on fire. Okay, so I definitely want to try this over the summer. I think I will keep a huge bucket of water nearby since I do tend to be accident prone.